Traditionally, devices that were tied to logins tended to indicate that in some way – turn on someone’s xbox and it’ll show you their account name, run Netflix and it’ll ask which profile you want to use. The increasing prevalence of smart devices in the home changes that, in ways that may not be immediately obvious to the majority of people. You can configure a Philips Hue with wall-mounted dimmers, meaning that someone unfamiliar with the system may not recognise that it’s a smart lighting system at all. Without any actively malicious intent, you end up with a situation where the account holder is able to infer whether someone is home without that person necessarily having any idea that that’s possible. A visitor who uses an Amazon Echo is not necessarily going to know that it’s tied to somebody’s Amazon account, and even if they do they may not know that the log (and recorded audio!) of all interactions is available to the account holder. And someone grabbing an egg out of your fridge is almost certainly not going to think that your smart egg tray will trigger an immediate notification on the account owner’s phone that they need to buy new eggs. Things get even more complicated when there’s multiple account support. Google Home supports multiple users on a single device, using voice recognition to determine which queries should be associated with which account. But the account that was used to initially configure the device remains as the fallback, with unrecognised voices ended up being logged to it. If a voice is misidentified, the query may end up being logged to an unexpected account. To be clear, I’m not arguing against the design choices involved in the implementation of these devices. In many cases it’s hard to see how the desired functionality could be implemented without this sort of issue arising. But we’re gradually shifting to a place where the data we generate is not only available to corporations who probably don’t care about us as individuals, it’s also becoming available to people who own the more private spaces we inhabit. We have social norms against bugging our houseguests, but we have no social norms that require us to explain to them that there’ll be a record of every light that they turn on or off. This feels like it’s going to end badly. Bob Herzberg, BMO builder and blogger at BYOBMO.com, fills us in on the whys and hows and even the Pen Wards of creating interactive Adventure Time BMO props with the Raspberry Pi. A conversation with BMO showing off some voice recognition capabilities. There is no interaction for BMO’s responses other than voice commands. There is a small microphone inside BMO (right behind the blue dot) and the voice commands are processed by Google voice API over WiFi. My first BMO began as a cosplay prop for my daughter. She and her friends are huge fans of Adventure Time and made their costumes for Princess Bubblegum, Marceline, and Finn. 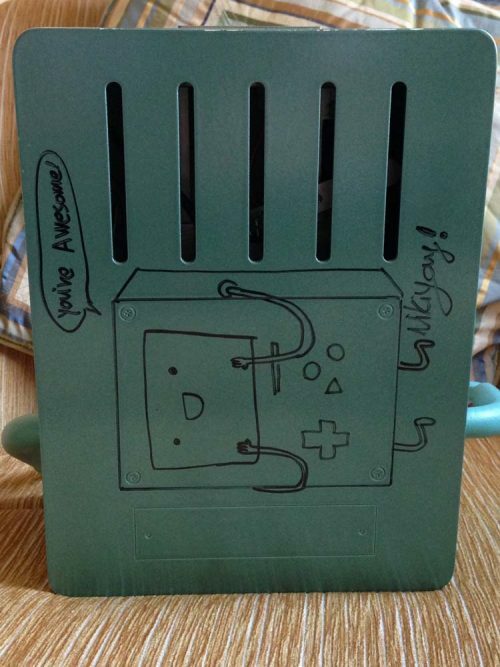 It was my job to come up with a BMO. I wanted something electronic, and also interactive if possible. And it had to run on battery power. There was only one option that I found that would work: the Raspberry Pi. 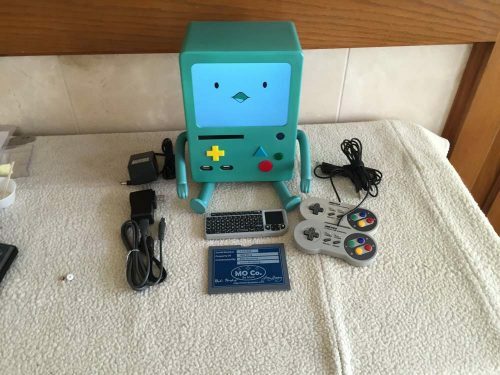 BMO’s basic internals consist of the Raspberry Pi, an 8” HDMI monitor, and a USB battery pack. The body is made from laser-cut MDF wood, which I sanded, sealed, and painted. I added 3D-printed arms and legs along with some vinyl lettering to complete the look. There is also a small wireless keyboard that works as a remote control. To make the front panel button function, I created a custom PCB, mounted laser-cut acrylic buttons on it, and connected it to the Pi’s IO header. 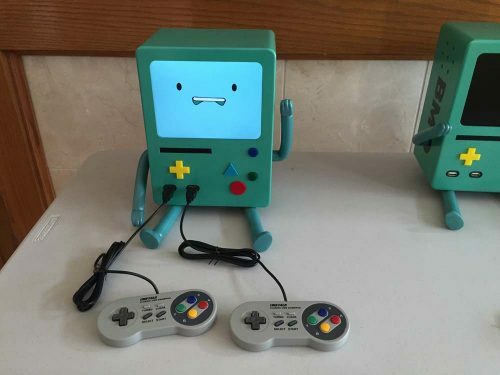 Custom-made PCBs control BMO’s gaming buttons and USB input. 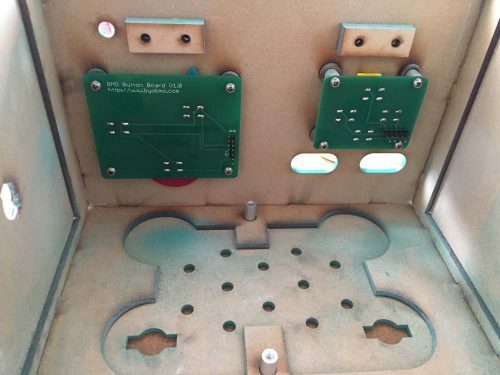 The USB jack is extended with another custom PCB, which gives BMO USB ports on the front panel. His battery life is an impressive 8 hours of continuous use. Most of BMO’s personality comes from custom animations that my daughter created and that were then turned into MP4 video files. The animations are triggered by the remote keyboard. Some versions of BMO have an internal microphone, and the Google Voice API is used to translate the user’s voice and map it to an appropriate response, so it’s possible to have a conversation with BMO. The Raspberry Pi Camera Module was also put to use. Some BMOs have a servo that can pop up a camera, called GoMO, which takes pictures. Although some people mistake it for ghost detecting equipment, BMO just likes taking nice pictures. Playing games on BMO is as simple as loading one of the emulators supported by Raspbian. I’m partial to the Atari 800 emulator, since I used to write games for that platform when I was just starting to learn programming. The front-panel USB ports are used for connecting gamepads, or his front-panel buttons and D-Pad can be used. BMO has been a lot of fun to bring to conventions. 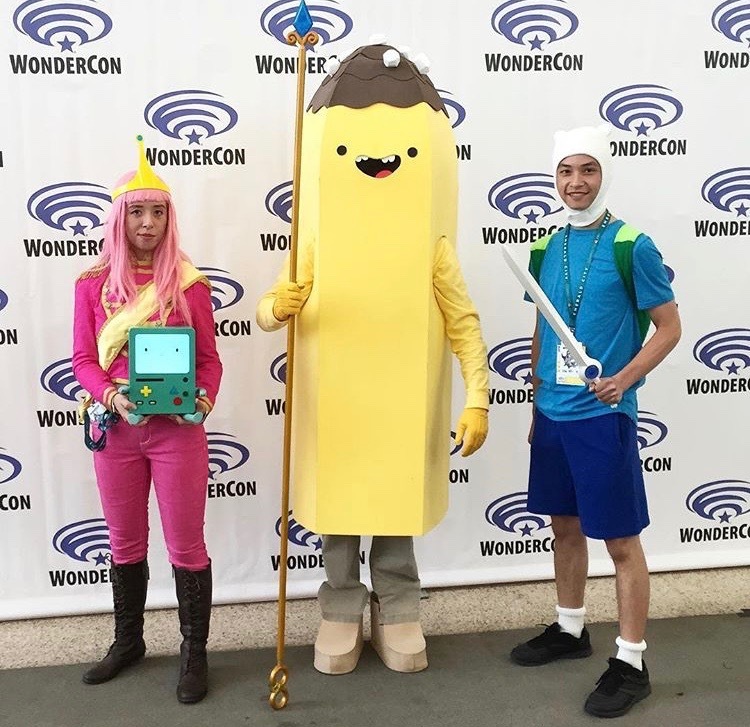 He makes it to ComicCon San Diego each year and has been as far away as DragonCon in Atlanta, where he finally got to meet the voice of BMO, Niki Yang. 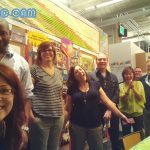 One day, I received an email from the producer of Adventure Time, Kelly Crews, with a very special request. Kelly was looking for a birthday present for the show’s creator, Pendleton Ward. It was either luck or coincidence that I just was finishing up the latest version of BMO. Niki Yang added some custom greetings just for Pen. BMO Wishes Pendleton Ward a Happy Birthday! Happy birthday to Pendleton Ward, the creator of, well, you know what. 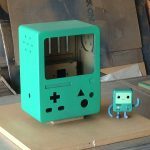 We were asked to build Pen his very own BMO and with help from Niki Yang and the Adventure Time crew here is the result. 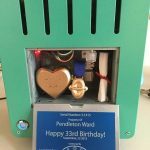 We added a few more items inside, including a 3D-printed heart, a medal, and a certificate which come from the famous Be More episode that explains BMO’s origins. BMO was quite a challenge to create. Fabricating the enclosure required several different techniques and materials. Fortunately, bringing him to life was quite simple once he had a Raspberry Pi inside! 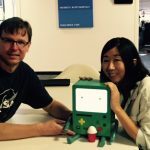 Be sure to follow Bob’s adventures with BMO at the Build Your Own BMO blog. 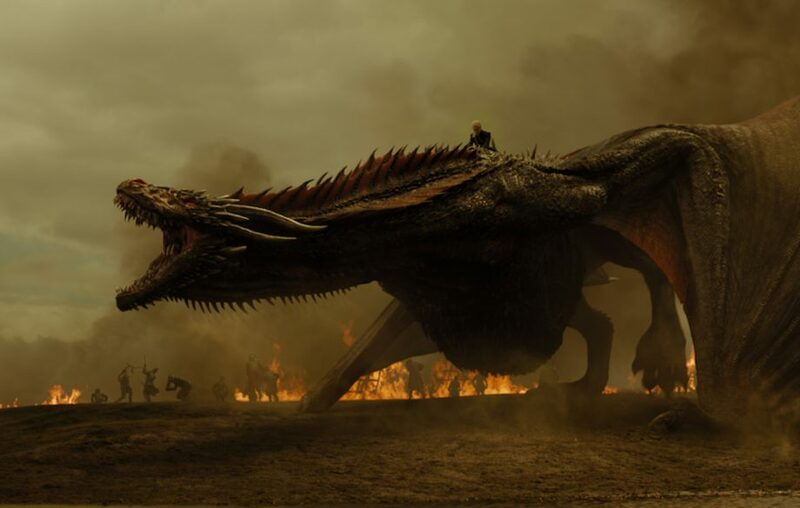 And if you’ve built your own prop from television or film using a Raspberry Pi, be sure to share it with us in the comments below or on our social media channels. 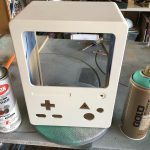 The post I am Beemo, a little living boy: Adventure Time prop build appeared first on Raspberry Pi. This column is from The MagPi issue 57. You can download a PDF of the full issue for free, or subscribe to receive the print edition in your mailbox or the digital edition on your tablet. All proceeds from the print and digital editions help the Raspberry Pi Foundation achieve its charitable goals. “I first set up my YouTube channel because I noticed a massive lack of video tutorials for the Raspberry Pi,” explains Matthew Timmons-Brown, known to many as The Raspberry Pi Guy. 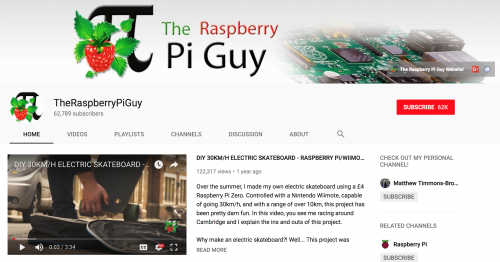 At 18 years old, the Cambridge-based student has more than 60 000 subscribers to his channel, making his account the most successful Raspberry Pi–specific YouTube account to date. 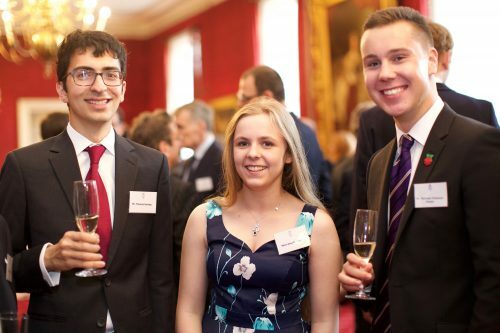 If you’ve attended a Raspberry Pi event, there’s a good chance you’ve already met Matt. And if not, you’ll have no doubt come across one or more of his tutorials and builds online. 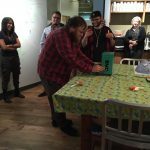 On more than one occasion, his work has featured on the Raspberry Pi blog, with his yearly Raspberry Pi roundup videos being a staple of the birthday celebrations. With his website, Matt aimed to collect together “the many strands of The Raspberry Pi Guy” into one, neat, cohesive resource — and it works. From newcomers to the credit card-sized computer to hardened Pi veterans, The Raspberry Pi Guy offers aid and inspiration for many. Looking for a review of the Raspberry Pi Zero W? He’s filmed one. Looking for a step-by-step guide to building a Pi-powered Amazon Alexa? No problem, there’s one of those too. Artificial Intelligence. A hefty topic that has dominated the field since computers were first conceived. What if I told you that you could put an artificial intelligence service on your own $30 computer?! That’s right! In this tutorial I will show you how to create your own artificially intelligent personal assistant, using Amazon’s Alexa voice recognition and information service! 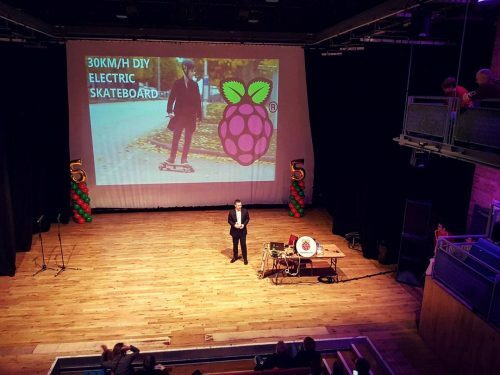 Last summer, Matt introduced the world to his Raspberry Pi-controlled electric skateboard, soon finding himself plastered over local press as well as the BBC and tech sites like Adafruit and geek.com. And there’s no question as to why the build was so popular. With YouTubers such as Casey Neistat increasing the demand for electric skateboards on a near-daily basis, the call for a cheaper, home-brew version has quickly grown. Over the summer, I made my own electric skateboard using a £4 Raspberry Pi Zero. Controlled with a Nintendo Wiimote, capable of going 30km/h, and with a range of over 10km, this project has been pretty darn fun. In this video, you see me racing around Cambridge and I explain the ins and outs of this project. Using a Raspberry Pi Zero, a Nintendo Wii Remote, and a little help from members of the Cambridge Makespace community, Matt built a board capable of reaching 30km/h, with a battery range of 10km per charge. Alongside Neistat, Matt attributes the project inspiration to Australian student Tim Maier, whose build we previously covered in The MagPi. 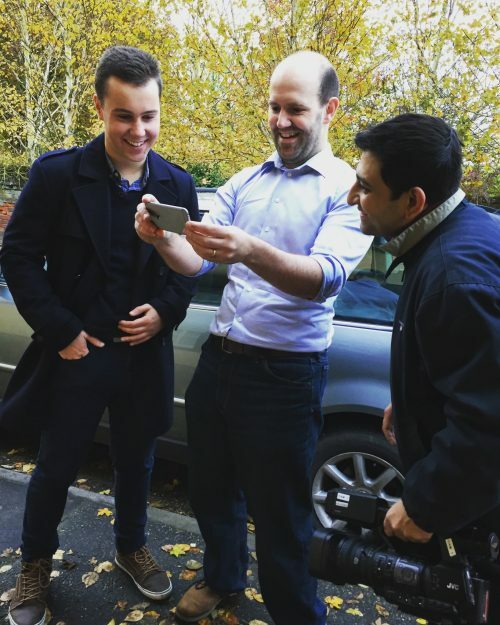 Despite the success and the fun of the electric skateboard (including convincing Raspberry Pi Trading CEO Eben Upton to have a go for local television news coverage), the project Matt is most proud of is his wireless LiDAR system for theoretical use on the Mars rovers. Using a tablet app to define the angles, Matt’s A Level coursework LiDAR build scans the surrounding area, returning the results to the touchscreen, where they can be manipulated by the user. With his passion for the cosmos and the International Space Station, it’s no wonder that this is Matt’s proudest build. Built for his A Level Computer Science coursework, the build demonstrates Matt’s passion for space and physics. Used as a means of surveying terrain, LiDAR uses laser light to measure distance, allowing users to create 3D-scanned, high-resolution maps of a specific area. It is a perfect technology for exploring unknown worlds. 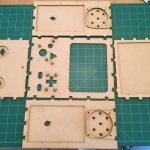 The post Community Profile: Matthew Timmons-Brown appeared first on Raspberry Pi. At some point, many of you will have become exasperated with your AI personal assistant for not understanding you due to your accent – or worse, your fantastic regional dialect! 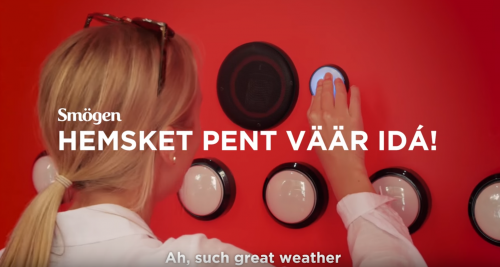 A vending machine from Coca-Cola Sweden turns this issue inside out: the Dialekt-o-maten rewards users with a free soft drink for speaking in a Swedish regional dialect. The world’s first vending machine where you pay with a dialect! Thirsty fans along with journalists were invited to try Dialekt-o-maten at Stureplan in central Stockholm. Depending on how well they could pronounce the different phrases in assorted Swedish dialects – they were rewarded an ice cold Coke with that destination on the label. The machine, which uses a Raspberry Pi, was set up in Stureplan Square in Stockholm. A person presses one of six buttons to choose the regional dialect they want to try out. They then hit ‘record’, and speak into the microphone. The recording is compared to a library of dialect samples, and, if it matches closely enough, voila! — the Dialekt-o-maten dispenses a soft drink for free. Testing the voices and fine-tuning the right level of difficulty for the users was quite tricky. And we really should have had more voice samples. Filtering out noise from the surroundings, like cars and music, was also a small hurdle. 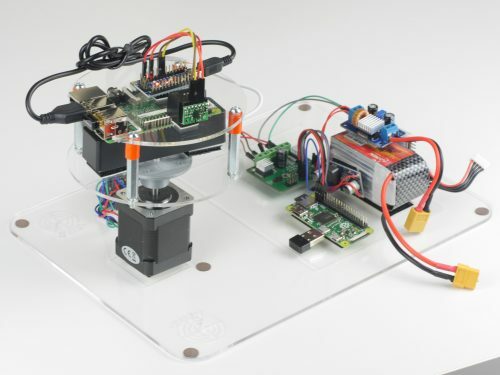 While they wrote the initial software on macOS, the team transferred it to a Raspberry Pi so they could install the hardware inside the Dialekt-o-maten. Even though Sweden has only ten million inhabitants, there are more than 100 Swedish dialects. In some areas of Sweden, the local language even still resembles Old Norse. 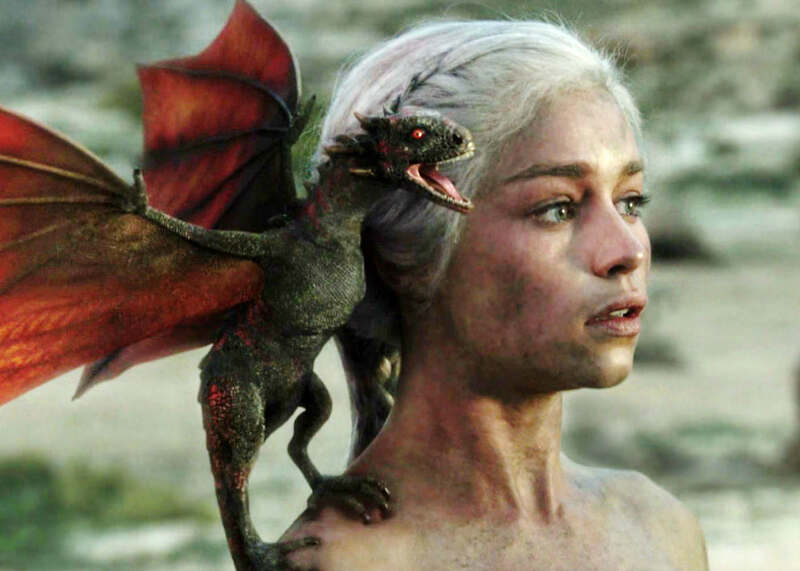 The Dialekt-o-maten recorded how well people spoke the six dialects it used. Apparently, the hardest one to imitate is spoken in Vadstena, and the easiest is spoken in Smögen. Because of its audio input capabilities, the Raspberry Pi is very useful for building devices that use speech recognition software. One of our favourite projects in this vein is of course Allen Pan’s Real-Life Wizard Duel. We also think this pronunciation training machine by Japanese makers HomeMadeGarbage is really neat. Ideas from these projects and the Dialekt-o-maten could potentially be combined to make a fully fledged language-learning tool! How about you? Have you used a Raspberry Pi to help you become multilingual? If so, do share your project with us in the comments or via social media. 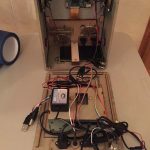 The post Dialekt-o-maten vending machine appeared first on Raspberry Pi.